The new mug shot of yours truly. Olympus EM-10 with Olympus m.Zuiko 45mm f1.8 lens. Exposure 1/200 sec, f3.2 at ISO 200. The “Strobist” phenomena burst onto the photographic scene some ten years ago and thanks to the efforts of David Hobby and the timely release of reliable affordable radio controlled flash triggers a whole movement was born. What was exciting was that Hobby advocated a lean and mean approach to lighting using affordable and portable speedlites. In an era of auto everything Hobby also broke the mould by showing people how easy it was to use manual flash. Joe McNally shooting Nikon and Syl Arena using Canon quickly jumped on the band waggon extolling the virtues of off camera flash using the TTL systems of Canikon. The other day I had the sudden realisation that I would need a new photo for the promotion of current exhibition as the one I had been using was out of date – I have considerably more hair on my head and less hair on my chin now. My preferred photographer is Liv Stockley but she is currently somewhere in Africa and unavailable for the job. So I would have to shoot this myself aided by my partner Helen. Using the Olympus OMD EM10 with the fantastic Olympus m.Zuiko 45mm f1.8 was a no brainer – bags of resolution, fantastic image quality and it allowed Helen to take the shot by controlling the camera via wi-fi using an iPad. Lighting was the conundrum. It would have to be flash, but how to control it? I wanted the key light in a big brolly box, but this would mean I would lose the TTL flash capability as Olympus use a line of sight light transmission system for their wireless flash. Once the slave flash is enveloped by a large light modifier it can’t pick up the signal from the master, so I would have to use a radio trigger. There are no reliable easily available radio controlled TTL triggers for the m4/3 system so it would have to be manual all the way and the excellent Hahnel Captur fit the bill perfectly. They are available from good camera stores, I got mine from Digital Camera Warehouse, and they have a good warranty. Why take a punt with cheap no name “poverty wizards” from dodgy Chinese Ebay sellers when you can get an excellent product locally? So that’s the triggering taken care of. To work out the exposure I used my trusty Minolta Auto Meter Ⅴ F. Sadly no longer made by Minolta as Sony took them over and canned the flash meter product line, but it is now made by Kenko. Yes it is old school and some may argue that in the digital era not needed, but I like working this way. In this scenario there is no need for TTL flash as the lighting and subject to camera distance remain constant. An Olympus OMD EM1 with the Hahnel Captur flash trigger in the hotshoe, and a Metz 64 AF-1 with the Hahnel Captur receiver. Canon EOS6d with Sigma 105mm f2.8 EX macro, Canon 430 and 550 EX Speedlites. Exposure: 1/180 sec, f8 at ISO 400. Equipment sorted the styling of the photo was the next consideration. The portrait would be a classic head and shoulders, but I wanted something clean and contemporary. Initially I thought about using the classic Rembrandt lighting style. It’s the studio portraitist’s bread and butter lighting, but it is a little bit staid. So I decided to go with broad lighting. One Metz Mecablitz 64AF-1 Flash in a brolly box was the key and a large reflector provided the fill. To provide a bit of separation from the background a Metz 44 AF-1 (now superseded by the 44 AF-2) fitted with a Hohnl Speed Grid. Simple and effective. 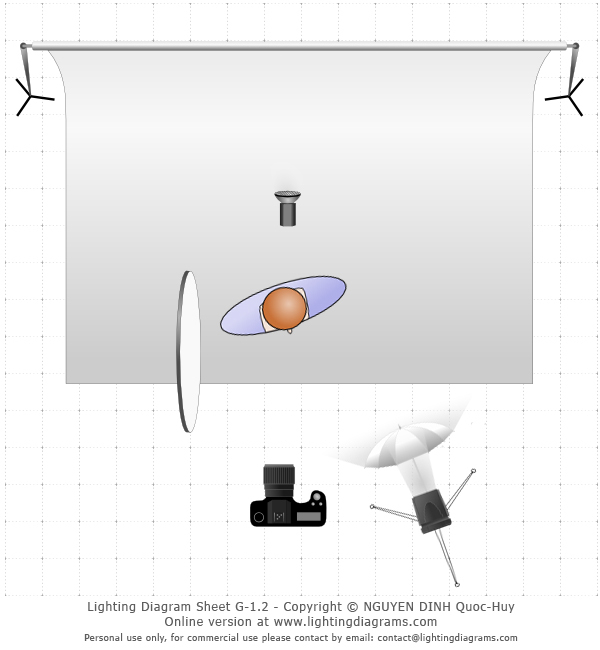 Basic lighting diagram for broad lighting using one key light, a reflector as fill and a gridded background light. So while the “Strobist” phenomena has largely gone out of fashion, the principles and skills are very useful and every photographer should have some grasp of the basics.